In Matthew Dicks’ The Perfect Comeback of Caroline Jacobs, main character, Caroline, takes a spontaneous trip to her hometown, teen daughter in tow, to confront her high school bully. But when she shows up on the grown woman’s doorstep, she’s warmly embraced and pulled inside before being served a cool glass of lemonade. Of course she’s thrown for a loop by this unexpected show of kindness from the person she feels ruined her life so many years earlier, so the reader and Caroline’s tough-as-nails daughter must wait to see how she will handle herself and if she will follow through with her plan. Earlier in the day, her mother had also served Caroline and her daughter glasses of lemonade. 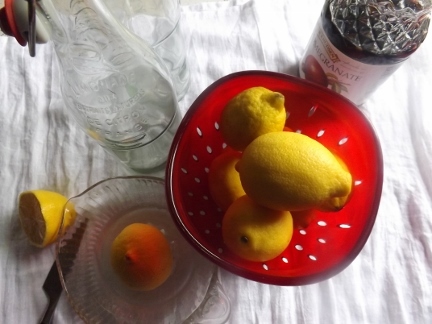 I was thinking as I read–and quickly developed a craving for fresh squeezed lemonade–how wonderful it would be to visit a town where residents had prepared bottles of the of the sweet tart concoction just waiting in their refrigerators for pop-in visitors. This inspired me to come up with my own that could easily be kept on hand. My recipe is more of a concentrated lemonade mix. I prefer it straight, over ice, but it is pretty potent for those who aren’t fond of extremely sweet/tart lemonade so can be diluted to taste with the addition of more water. To make the simple syrup, combine the equal parts sugar and water in a small saucepan. Bring to a boil and cook just until the sugar is dissolved. Combine the chilled syrup, lemon juice, and pomegranate juice. Stir in one cup water. Bottle and refrigerate. Add water to dilute, if desired, and serve over ice. I loved The Perfect Comeback of Caroline Jacobs! 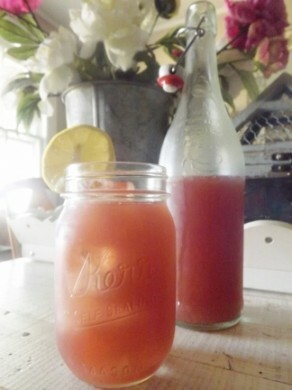 Made your scrumdidleyumpcious Pomegranate Pink Lemonade w my dtr today, with and without lemon vodka. Loved it! Promises of eternal replenishment made by, to, and for all who drank a glass or two with dinner tonight. Thank you!